We’d love your help. Let us know what’s wrong with this preview of Medicine Cards by Jamie Sams. To ask other readers questions about Medicine Cards, please sign up. I own the book do you sell the 52 card deck seperate? Sharon Williams If your store doesn't sell the deck seperate is it sold as a book only or does it have the 52 cards included with the book? I'm confused about the Pathway Spread. With all the cards facing in the "up" position, I simply shuffled them. So when I did the spread none were in the "upside down" position. The position for Card #7 is defined as "What is working against you." I drew Owl (#21). the text says "You are being asked to use your powers of keen, silent observation ... (etc). If so, how is Owl working against me? My favorite deck related to animals for divination. This deck connects the natural attributes and behaviors of the animal with the spiritual lore relating to each creature in a way which is both sensible and spiritual. The suggestions for meditation are evocative, and I find myself returning to them again and again. Animals have been my guides and teachers since before I could talk. I prefer not to call them "totems" for myself, because I do not have the honor of being Native American. But Jamie My favorite deck related to animals for divination. This deck connects the natural attributes and behaviors of the animal with the spiritual lore relating to each creature in a way which is both sensible and spiritual. The suggestions for meditation are evocative, and I find myself returning to them again and again. Animals have been my guides and teachers since before I could talk. I prefer not to call them "totems" for myself, because I do not have the honor of being Native American. But Jamie Sams is, and thus she brings her ancestral learning and the experiential the wisdom of her life and teachers to bear in a way which is accessible and lyrical. Be sure you buy the most recent edition, there is an older edition which includes fewer animals, you will often find that offered cheaply at used book stores. The revised edition has the complete set of cards. 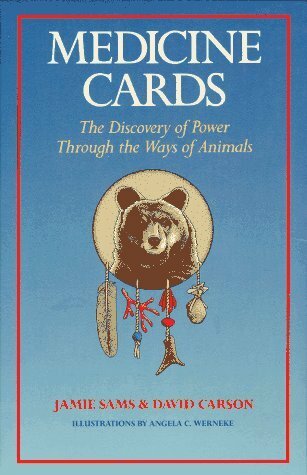 A book I refer to often, either when I'm using the medicine cards to glean what's coming or when I've seen an animal or bird I haven't seen in a while to remind myself what it means. For me this book is a handbook to understanding messages received from the Divine through nature. I have found this book to be wonderfully on target for checking messges from the animal world. Whenever I encounter an animal, whether it be a dead skunk by the side of the road or a deer in the woods, I open the book to see what sort of message the universe might be offering. I really like this book, if you're at all interested in animal symbolism I recommend it. I like it much better than the Ted Andrew's books. However, and always, take it with a big grain of salt. Symbolism is a very personal thing, these are just broad guidelines. I like the cards themselves, however they feel very cheap, I wish they actually felt like real cards. They need to be thicker. 2) provide a means, another perspective, when dealing with life issues/questions. I have owned this set of oracle cards and guidebook for over 20 years, and they remain one of my favourites. The messages always clearly reflect whatever life situation I am going through at the time, and when an animal appears to me in my environment or in dreams I often turn to this guidebook for insight and understanding of the lesson I am being taught. I am truly grateful for the many ways this oracle set has helped me to grow over the years. I was inspired to delve into this reading after a powerful encounter with a Fox. The ancient tribal wisdom of animal medicine needs to be revived in our modern culture. Wonderful book, with artful descriptions of the Choctaw, Lakota, Seenca, Aztec and more. Highly recommend. I initially borrowed these cards from a friend and connected with the cards instantly, then had to buy them for myself. The cards not only provide accurate readings, they also help you to connect with your spirit animals. Both the book and cards fit perfectly together. The book alone is fantastic for learning about spirit animals. I would highly recommend getting these cards. This is an amazing book that I use for energy Healing sessions with clients. I love the Native perspective on the Earth, nature, creation, and ways to tune ourselves in to the examples of animals, and incorporate them into healing and medicine animals. Wonderful words that make me realise how much I love to read good things. These are positive affirmations and a daily activity. These words strung together are like fairy lights and form powerful pages and proverbs. What is your spirit animal? Mine is Moby in Wonderland. Most divination books start off with some chapters on the cosmology, where does the symbolism come from, what are the roots and how deep do they go. Then they move onto card spreads and the meanings of the cards. This book follows that pattern pretty closely. My problem with animal symbolism is that I feel so cut off from animals as a day to day part of my life that the book has to do a really good job grounding the symbolism of the animal. I feel like this book needs a whole book of native myth Most divination books start off with some chapters on the cosmology, where does the symbolism come from, what are the roots and how deep do they go. Then they move onto card spreads and the meanings of the cards. This book follows that pattern pretty closely. My problem with animal symbolism is that I feel so cut off from animals as a day to day part of my life that the book has to do a really good job grounding the symbolism of the animal. I feel like this book needs a whole book of native myths of the animals to get that job done. Which it doesn't have, of course. The beginning chapters also seem very minimalist and suffer for it, though it looks like her book Earthways might fill in some gaps. Some reviewers don't like the pen and ink drawings, and they do lake a busyness that a lot of card systems have. I love the drawing and find it evocative, but, again, a grounding in mythology would help. White peeps profiteering on Native American belief systems. A very meaningful and interesting look into Native American medicine and its connection to the animal world. I actually won the deck of cards at a gift exchange party (apparently not a coincidence), and had to track down the book to learn about how to use them. I am so glad I found it! Medicine is anything that improve's one connection to life, and animals offer medicine through their observable traits, which provide healing lessons and messages. While I do not have much knowledge or experience w A very meaningful and interesting look into Native American medicine and its connection to the animal world. I actually won the deck of cards at a gift exchange party (apparently not a coincidence), and had to track down the book to learn about how to use them. I am so glad I found it! Medicine is anything that improve's one connection to life, and animals offer medicine through their observable traits, which provide healing lessons and messages. While I do not have much knowledge or experience with Native American spiritual traditions (sadly), upon reading through this book, I felt instantly connected. The book provides information on how to read an animal totem, animal spreads, a medicine wheel and a medicine shield. Each animal and its significance is explained thoroughly and in a way that makes sense. I've started offering animal totem spreads to my energy work clients because I was so touched by this book's message. Animals are important and can be great teachers if we are willing to pay attention to the messages they are sending us. Il cofanetto si compone di un mazzo di 54 carte e un libro in cui, dopo una premessa alla medicina degli animali, vengono presentate singolarmente le varie carte: ne viene spiegata la "storia" e l'insegnamento che la carta, a seconda che venga estratta dritta o rovescia, ci vuole insegnare. Non mancano, a fine tomo, varie indicazioni sulla stesura; personalmente, sono solita estrarre una carta al bisogno e, finora, mi hanno sempre portato conforto e chiarezza sulla strada da seguire nella vita. Il cofanetto si compone di un mazzo di 54 carte e un libro in cui, dopo una premessa alla medicina degli animali, vengono presentate singolarmente le varie carte: ne viene spiegata la "storia" e l'insegnamento che la carta, a seconda che venga estratta dritta o rovescia, ci vuole insegnare. Non mancano, a fine tomo, varie indicazioni sulla stesura; personalmente, sono solita estrarre una carta al bisogno e, finora, mi hanno sempre portato conforto e chiarezza sulla strada da seguire nella vita. Nonostante sappia anche leggere i tarocchi, mi trovo molto più a mio agio nel consultare questo deck che si compone di illustrazioni affascinanti, evocative e ricche di dettagli. I purchased this way back in the 90's, and at the time, really got a lot out of it. Somebody had given me a reading based on these cards, and I raced out to buy it immediately, because it was exactly what I needed at that time. I felt the pictures were beautiful, and especially the wisdom the books offered. Now, I'm more into Druidry, (just starting out) and as time has gone on, I feel the illustrations are a bit plain and basic compared to what is on offer these days. I have the Druid Animal Orac I purchased this way back in the 90's, and at the time, really got a lot out of it. Somebody had given me a reading based on these cards, and I raced out to buy it immediately, because it was exactly what I needed at that time. I have the Druid Animal Oracle deck, which these days I prefer. Funnily, I got it because it reminded me so much of the Medicine Cards and I had such great memories of it. The star of this set is undoubtedly the book. It is filled with deep, ancient wisdom that continues to make a profound impression upon me. This wisdom is what gives power to the cards. I found a copy of the book at a thrift store and I bought it to use as an animal totem reference book. I find that it can be used similarly to Animal Speak by Ted Andrews, which is my favorite book of animal wisdom. Fantastic stuff! I have looked at the cards and I think they are a suitable companion. The artwork The star of this set is undoubtedly the book. It is filled with deep, ancient wisdom that continues to make a profound impression upon me. This wisdom is what gives power to the cards. I found a copy of the book at a thrift store and I bought it to use as an animal totem reference book. I find that it can be used similarly to Animal Speak by Ted Andrews, which is my favorite book of animal wisdom. Fantastic stuff! I have looked at the cards and I think they are a suitable companion. The artwork is basic and functional, nothing extraordinary. This deck would be good for you if you are interested in how Spirit communicates to us through creatures great and small. I have LOVED my deck and book since 1996. These cards definitely speak to me every time I use them. I often use the book as a simple reference as well when something causes an animal to cross my path unexpectedly in every day life. Ted Andrews' Animal Speak book is another one I often refer to in conjunction with these. Reading this book will give you a lot to think about. However, Keep in mind that in the original practice that these cards are based around you wouldn't have been able to do this without a shaman present. You learn a lot from the animal descriptions, but the cards are a waste of time unless you are a shaman. And even then, still probably a waste of time. A dear friend introduced me to this fantastic book & cards set. It meshes really well with Jungian archetypes, and while the scientist in me was skeptical of "finding my totem animals," the cards I ended up picking--face-down--were UNBELIEVABLY UNCANNY. Seriously. It encourages introspection. I'm not typically one for divination, but I wholeheartedly recommend this set. I am in love with this book and card deck. Even my 3.5 year old loves to play "the medicine card game" where we guess the animal she's holding and she gives hints. The images are beautiful and the cards have already been very useful in the short time I have been using and meditating with them.. This is a book that you do not read as a story, but more as a guide to life. Asking yourself to find your personal truths and then finding how this book relates to those truths. I find the little bits of history of Native American cultures to be amazing insight into how we have lost our ways. A view from the Native Way, Learn of your totom and your spiritual guides in this book. Remember though, This is only a brief idea, to truely find it, you must go through the vision quest. Happy reading to you. Awesome birthday gift from Marquita. I have been into the symbolism of animals and animal totems for a little over a year now. I'm looking forward to using this book and these cards in my continual efforts to learn from the symbols in my life...and animals as guides, particularly. Very practical, illustrative, and insightful guide into the spiritual medicinal healing approach as told from native american perspective. Very useful to anyone interested in non alternative methods of recovery, well being. Accompanied by a set of illustrative index cards.